Although fall is a rare event in the life of a humanoid robot, we must be prepared for it because its consequences are serious. 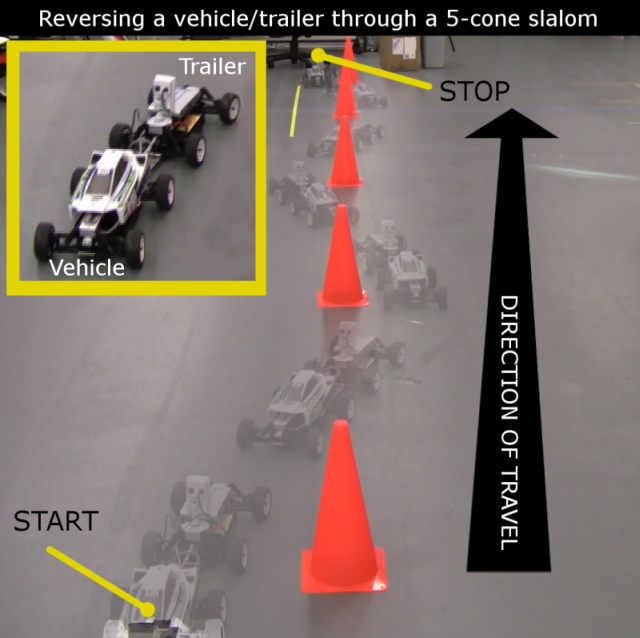 We present a fall strategy which rapidly modifies the robot's fall direction in order to avoid hitting a person or an object in the vicinity. Our approach is based on the key observation that during "toppling" the rotational motion of a robot necessarily occurs at a leading edge or a leading corner of its support base polygon. To modify the fall direction the robot needs to change the position and orientation of this edge or corner vis-a-vis the prohibited direction. We achieve it through intelligent stepping as soon as a fall is detected. 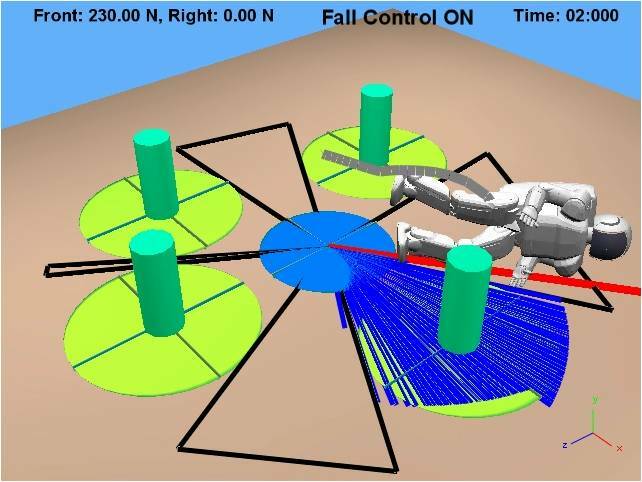 We compute the optimal stepping location which results in the safest fall. Additional improvement to the fall controller is achieved through inertia shaping techniques aimed at controlling the centroidal inertia of the robot. We demonstrate our results through the simulation of an Asimo-like humanoid robot. To our knowledge, this is the first implementation of a controller that attempts to change the fall direction of a humanoid robot. If you could reduce the instantaneous inertia of the entire humanoid robot to that of a single rigid body, what would it be? Simple models of complex dynamic systems are often instrumental in our understaning of their essential behavior. Such models must possess simplicity and compactness while not over-simplifying the system. The linear inverted pendulum model and a number of its variations are frequently used in the gait and balance study of human and humanoid robots. By focusing attentionto the fundamental aspects of humanoid dynamics, such models open the way to new classes of control laws, which would otherwise be difficult or impossible to conceive. While useful in their own right, a limitation of the above models is that they represent the entire humanoid body only as a point mass and do not characterize the significant centroidal moment of inertia of the humanoid body. The centroidal moment of inertia is a property of the distributed masses of the robot limbs (head, arms, legs, etc) away from the CoM. We study the Reaction Mass Pendulum (RMP), a reduced model version of the complete humanoid robot. This model compactly captures the centroidal angular momentum of the humanoid robot as a spinning ellipsoid which continuously changes its shape, size and orientation. We also introduce Inertia Shaping, a high-level approach to modify the kinodyanmic properties of a humanoid.